End With Care at GIVE65.org! We have again been selected as a featured nonprofit on Home Instead Senior Care Foundation’s GIVE65 - a crowd-fundraising platform exclusively devoted to helping nonprofits raise funds online for worthy programs and services. At GIVE65.org, End With Care has been invited to showcase our mission and programs that are helping individuals and those who care for them. End With Care is offered completely free of charge and allows individuals, families, friends, and caregivers to find the information that they need quickly and easily. We are raising money to help bridge those who are in need at the end-of-life to those who can provide care, services, and support. 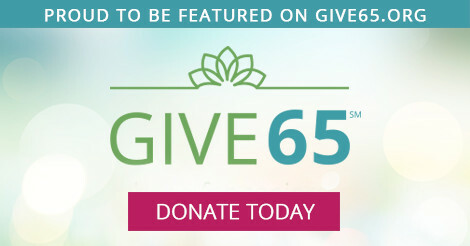 Visit www.give65.org/endwithcare2018 or click the DONATE TODAY button to make a tax-deductible gift through GIVE65. We hope that you will consider joining us in our mission to help improve the quality of life at the end-of-life.